The trial of the leader of the proscribed Indigenous People of Biafra, Nnamdi Kanu, was stalled on Monday in a Federal High Court, Abuja due to the absence of the judge. An official of the court informed parties that the trial judge, Justice Binta Nyanko, had gone to attend the Judges’ Conference within the city. 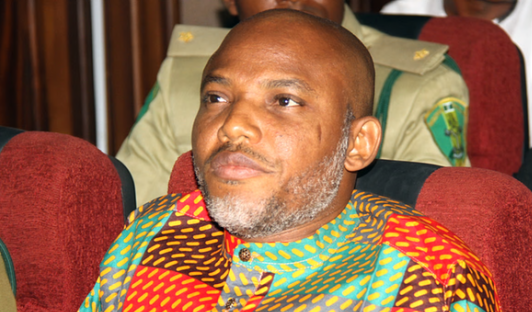 Nyanko had ordered Senator Enyinnaya Abaribe, who stood surety for Kanu, to appear in court on November 20 to account for his whereabouts. The order was predicated on report from Kanu’s Counsel, Ifeanyi Ejiofor, who claimed on October 18 that his client could not be found. Abaribe, who was in court, however, told journalists that the military unsettled Kanu, adding that his whereabouts was not known to him either. The lawmaker said it was on the basis of that uncertainty that he filed an application to withdraw his suretiship. Also ordered to account for Kanu’s whereabouts were: Tochukwu Uchendu and Jewish Chief High Priest Immanuel-El Shalom Oka-Ben Madu. Shuaibu Labaran, the Prosecuting Counsel, had through an application demanded that Kanu’s sureties be made to produce him to allow the trial to continue. Kanu is standing trial on treasonable charges along with Chidiebere Onwudiwe, Benjamin Madubugwu and David Nwawuis.